You know how there are some people that you just go back with? I mean way, way, waaaaay back? As in, they’ve known you just about most of your life and no matter how long ago it was, or how much the two of you have changed over the years, you two will always have that ‘Rainbow Connection’ that you know very well you’ll never get with people you meet these days? See, I’m like that with food. Certain foods anyway. I’m an introvert with people, but there are a few foods that I bond with on a higher, deeper, more intimate level because they’ve just always been hanging around in the subconscious of my mind for as long and as far back as I can remember. Does that make me weird? Maybe, but I’m a foodie and I like myself so whatevs. Guys, Hot Cross Buns and I are connected. We have a bond. It’s been going on for a while- and I do mean a WHILE. As in, like…twenty years. You know the funny thing? We’ve never even ‘spoken to’ each other until two days ago. (Meaning two days ago was the first time I actually ate a hot cross bun). But Jess, I’m sure you’re thinking, how is it possible to be bonded to a food you’ve never even met? I was just getting around to that. Me and my sisters has this VHS tape when we were little of a huge collection of British nursery rhymes that we watched a lot. All the time actually. We recently found it on DVD on Amazon and ordered it for my baby niece to watch now. I may or may not have watched it by myself to take a walk down memory lane and thoroughly enjoyed myself. I was slightly amused at how much the quality of kid’s movies has changed in the last twenty years-in comparison to what’s out there for them now, it’s clear to me that it obviously took so ‘little’ to hold the attention of kids of the 80’s or 90’s. Or maybe we just weren’t missing what we didn’t have, I don’t know. But somewhere in between my nostalgia and amusement, my attention was suddenly caught by one of the nursery rhymes in the movie called ‘Hot Cross Buns’. I’m sure most of you guys know it. Then it hit me: I could remember wanting to try one before. You guys see what I’m getting at here? It was the food, or rather the memory of wanting that food that made me form a connection to hot cross buns that’s spanned a period of over twenty years. Now THAT’S what I call a craving. If a craving lasts for over 20 years, then you just have to honor it- you’ve suffered and deprived yourself long enough, am I right?Am I RIGHT? Fortunately hot cross buns are kind of a popular thing to make this time of year. I found a recipe on The Kitchn website rather easily, but I decided to make several changes to it to make it my own, using chamomile tea in the dough instead of Earl Grey (because it’s what I had at the time). I also topped the buns off with some melted orange marmalade I had sitting around the pantry, and piped the cross myself (yes, I know my piping skills are abysmal. You didn’t have to bring it up). I gotta say guys…these babies were well worth the 20 year wait. Yum, yum, and more YUM. OMG, I just remembered: I get to co-host this week’s Fiesta Friday #62 with Prudy@ButterBasilandBreadcrumbs who is basically one of my favorite people ever! And I get to bring these Hot Cross Buns to the party? I don’t know who’s more lucky- you or me. Tell you what, while I sit here and try to figure it out, why don’t you mosey on over to our brand spankin’ new Party Hall and join in the festivities? We’d love to have you- and any food you’d care to bring and share with us! Bring the water to a boil on the stovetop or in the microwave. Remove from heat and steep the tea bags in the water for 15 minutes. Remove the tea bags, squeezing as much liquid as possible out of them and discard. Let the tea cool until it is lukewarm (about 100°F). In a small bowl, stir together the brewed tea, yeast, sugar and 1/2 cup of the flour. Set aside for 15 minutes. Heat the butter and milk together in a small saucepan over a low heat until the butter has just melted; remove from heat and cool to room temperature. Whisk in the egg. In a large mixing bowl, stir together the remaining flour, salt, mixed spice, lemon zest, orange zest and currants. Pour the tea mixture and the milk mixture over top. Stir together until there are only a few floury patches remaining. Tip the contents of the dough out onto a work surface and knead until smooth, about 10 minutes. Clean the large mixing bowl and grease with some oil. Place the dough in the bowl, cover with oiled plastic wrap, and leave in a warm place to rise until doubled in size, about 1 hour. Divide the risen dough evenly into 12 pieces and roll them into balls. 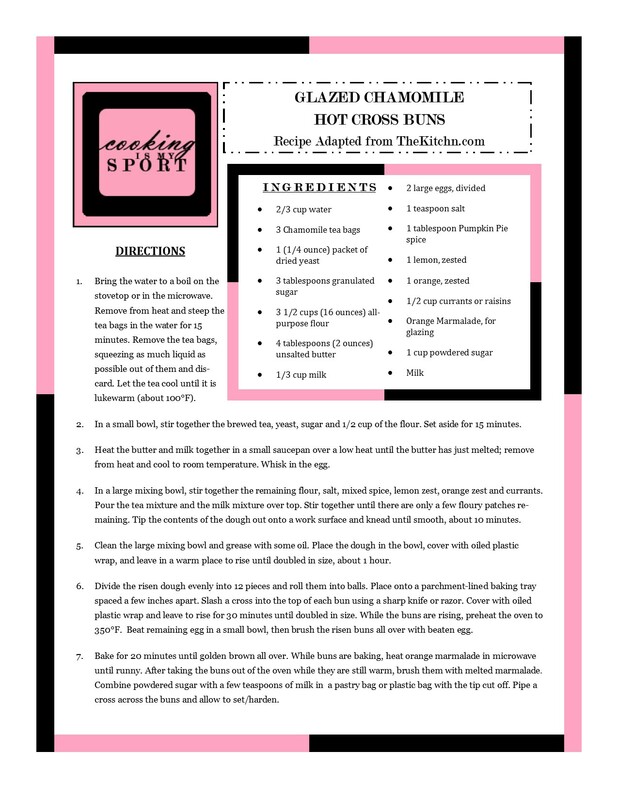 Place onto a parchment-lined baking tray spaced a few inches apart. 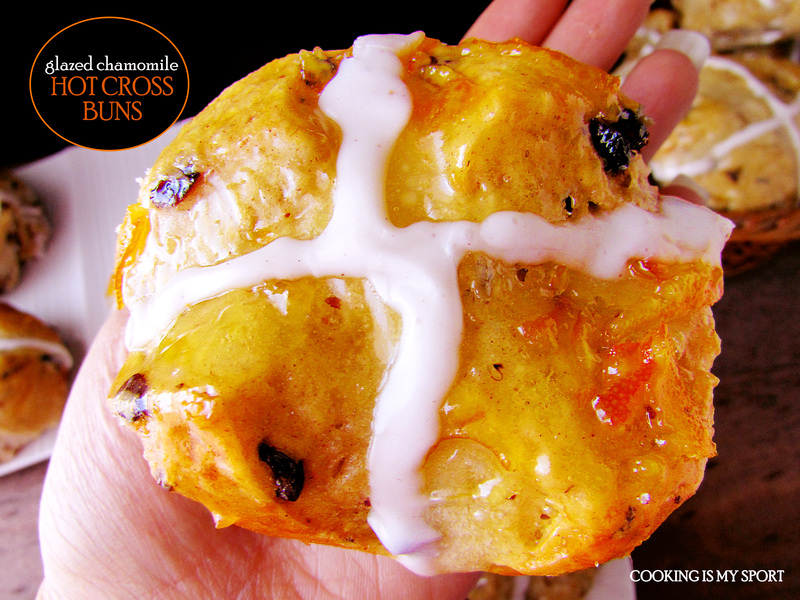 Slash a cross into the top of each bun using a sharp knife or razor. Cover with oiled plastic wrap and leave to rise for 30 minutes until doubled in size. While the buns are rising, preheat the oven to 350°F. Beat remaining egg in a small bowl, then brush the risen buns all over with beaten egg. Bake for 20 minutes until golden brown all over. While buns are baking, heat orange marmalade in microwave until runny. After taking the buns out of the oven while they are still warm, brush them with melted marmalade and allow to completely cool. Combine powdered sugar with a few teaspoons of milk in a pastry bag or plastic bag with the tip cut off. Pipe a cross across the buns and allow to set/harden. This looks amazing! I have to make some right now!!!! Thanks Renee- let me know if you try it and tell me how it turned out for you! I’m glad 20 years was worth the wait! The chamomile sounds delicious! I’ve never considered infusing the water used in the dough. How strongly did the flavour come out in the buns? VERY strongly, steeping the tea bags in the water really helped out. Plus, the citrus zests help to bring out the flavor of the tea as well. Thank you! These sound absolutely beautiful!! I am intrigued by the Chamomile! I defiantly see the ‘connection’! Nicely done! These hot buns look amazing!!! Yum these look awesome Jess! Love the addition of Chamomile! Thanks Naina- they taste really yummy, so I’m happy to have finally tried them. Ha! The nursery rhymes is the way that I was introduced to hot cross buns too. I haven’t made them yet but I love all homemade breads and this one is on my radar. I am sure the Chamomile was a delightful touch! Thanks Julie- give it a try, they’re really a delicious yeast bread, and super easy too. Ohhhhh thank you for cohosting this week! Hey, I did a double take when I saw your profile pic. Did you always have glasses? 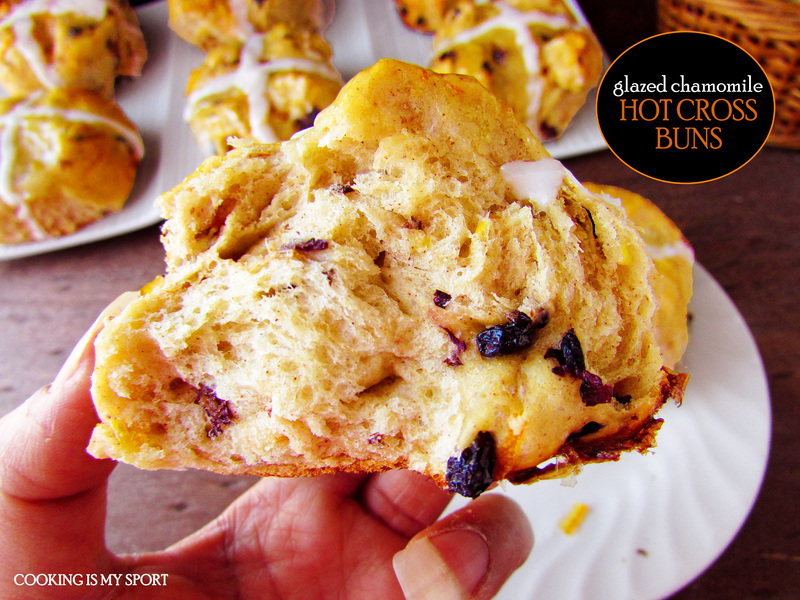 Anyway, I love this take on the hot cross buns. Delicious! 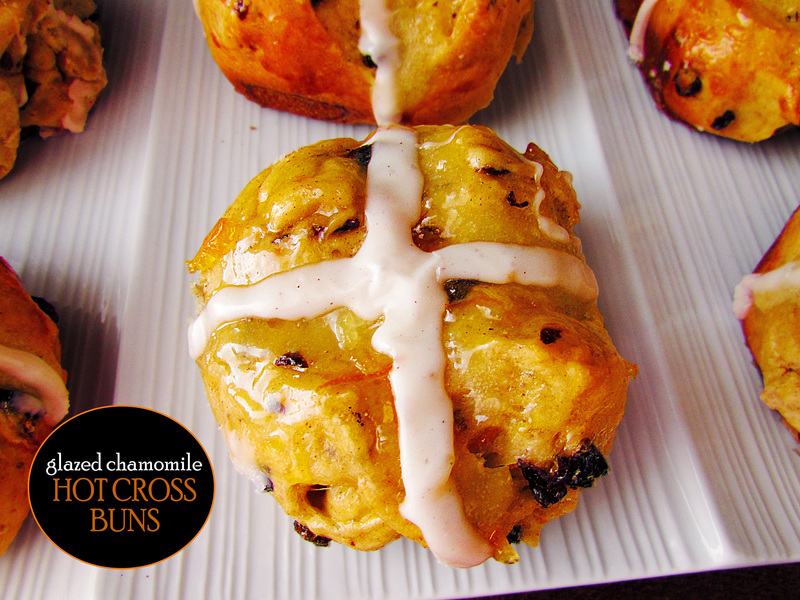 They are the most interesting hot cross buns I’ve ever seen! I loved seeing this post! 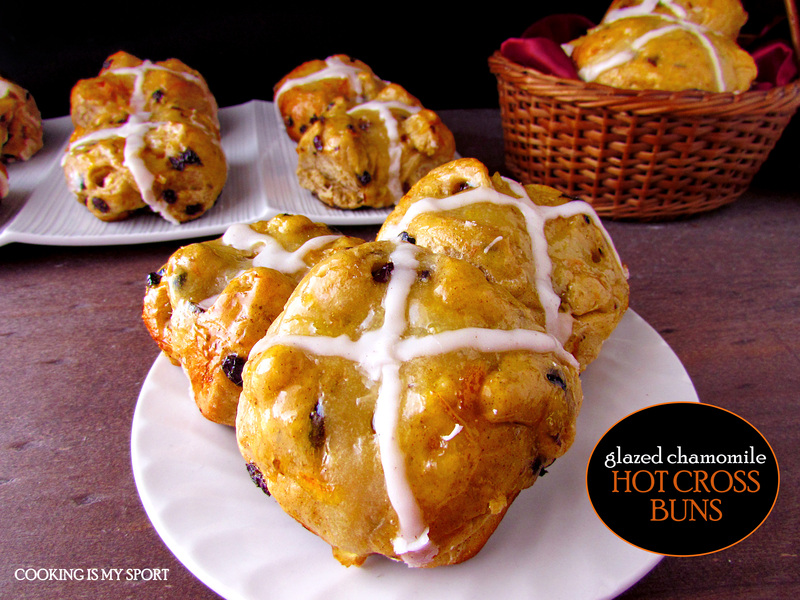 I’ve been trying to look for different ways to spice up traditional hot cross buns. This is a great way to put a twist on them Annie, give em a try, I don’t think you’ll be disappointed! Indeed Loretta-I decided to actually follow a trend for once in my life lol Thank you! Nice texture there and lovely combination of flavours! I held off on making hot cross buns last year Sarah, and this year I TOTALLY see what all the fuss was about. Next year GO FOR IT. Trust me lol Thank you! 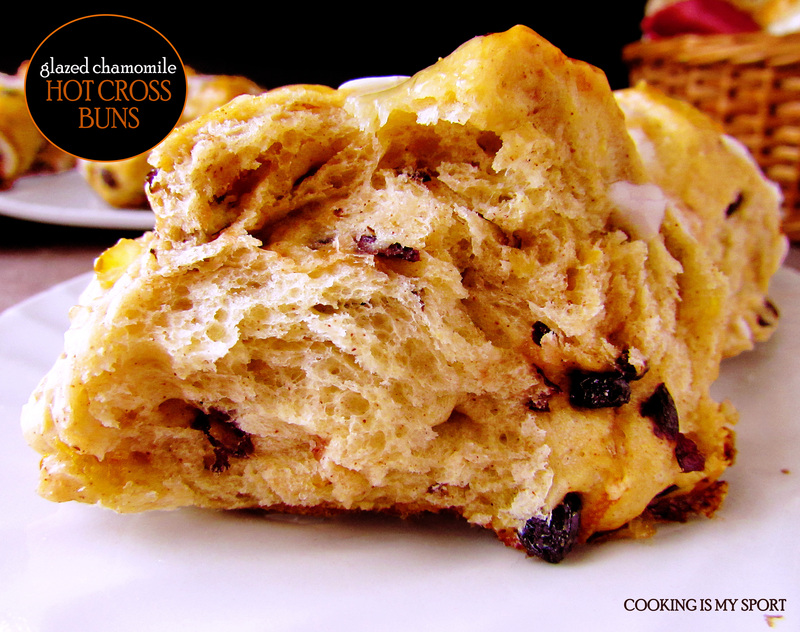 I remember that childhood song …something about Hot Cross Buns …yep! These look absolutely wonderfully delicious! And so pretty!! Perfect Jess! Thanks apsara, you’d be surprised at how well the flavor of the tea works with the citrus zests. 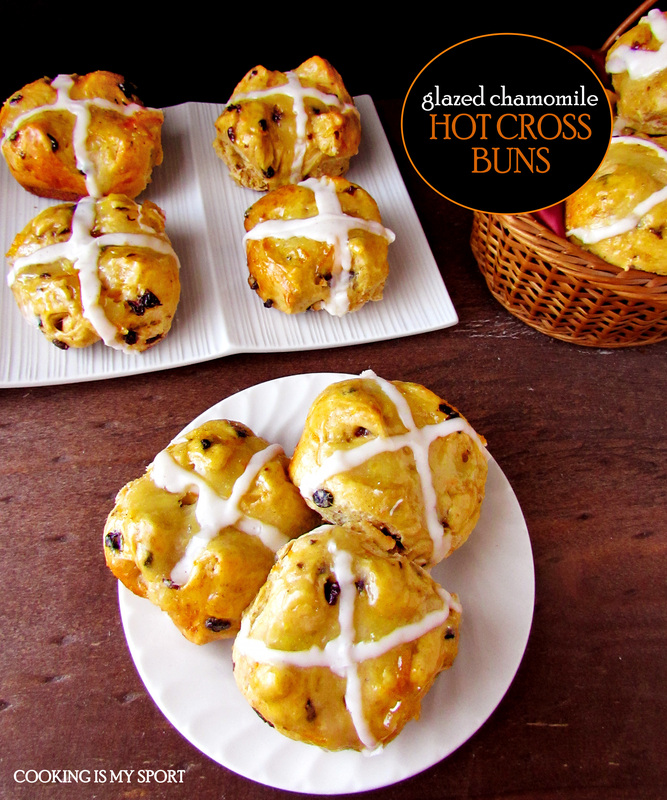 Your hot cross buns look delicious! It brings back childhood memories, when my mom used to make at Eastertime.